Recently I had the opportunity to stop at the Coach outlet in Livermore, CA. Often when I drive up to the SF Bay Area I will first stop at Coach and just sort of check out what they have. This time I had a vague notion of getting a new wallet. 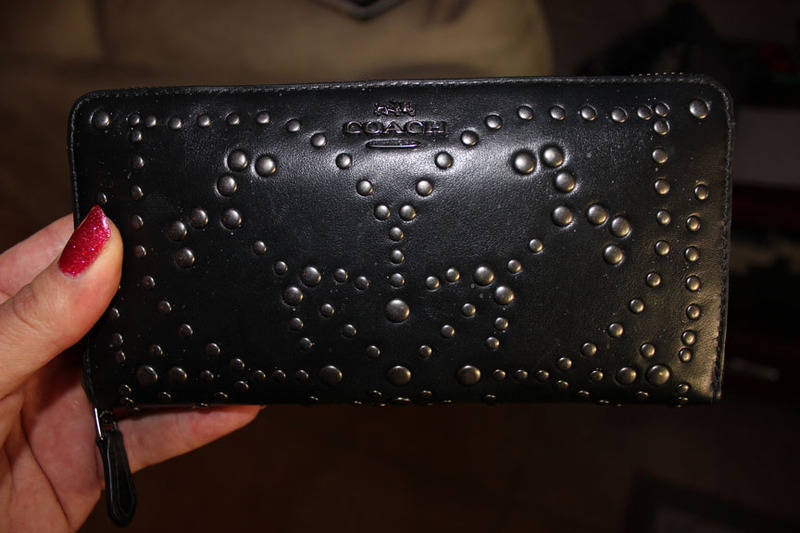 I had been using a different Coach wallet, which was a half fold one. That one was very small and convenient to carry around with me, but I always got frustrated. It tended to be just a bit too small for me to easily get my money in and out of it. The bill compartment was just large enough to fit paper money in it without folding it but I seemed to always struggle with it. The other issue that I had with it is that it is partially fabric. Thus the fabric was slowly, but surely, getting to be a different color from absorbing my oils and dirt from my hands. Yuck! So anywho... I wondered around the Coach store and spotted this lovely little puppy! And I love it! First off, it is a full size wallet and thus my paper money fits into it just fine. Secondly it has a zipper that closes the whole thing right up. Plus it has a change holder in the middle of it; super convenient. But the thing that I think I like the most about it is it's edgy feminine styling. It is a female wallet for sure, but being in black and with the rivets all over it, it has kind of a tough feel to it. But it is a feminine toughness. The rivets for example are in the pattern of a flower. It starts on the front side and wraps around the bottom to the back side. If you were able to lay it out fully you would see a whole flower pattern; though it does not open to fold out flat for a photo! I really like that look. That sort of in-between look. Hmmm.... really? Me? The in-between look? Surely you must be kidding? Ha-ha! So, um, yeah. I love my new wallet. I think it shows off my style just right! Do any of you others out there carry a female wallet or purse while dressed as a man? How about you ladies out there? Do you prefer a male's wallet? Do you avoid purses? I'd love to hear what you all out there in the blogoshpere do! Nice! I need a new wallet myself. My current one is very manly and it feels weird fishing it out of my purse. The one you picked is gorgeous and perfectly androgynous. I don't even remember when I last used a male wallet. Hmm.... I wonder when that was..... nope, no memory of it! Though I do remember having a male wallet in my purse for a bit. I do recommend getting a female one. I have SO enjoyed the various ones I have used far more than my male one. Your pretty wallet got me a thinking...Is your ID (driver's license) gender marker male or female? My driver's license, photo and gender marker are male. Apparently that is a tough thing to change. As well as I don't live life as a woman, just on occasion.